Liberty Cider Works is one of two Spokane-area businesses hopping on the cider bandwagon. The distinctive aromas of fruit and yeast are immediately perceptible. At first, the combination is redolent of an apple pie baking in the oven, yet not as sweet, and there’s also a richer tinge to the air that brings to mind gently swirling and inhaling the notes in a glass of red wine. These are the smells of cider being made. In a newly renovated downtown warehouse on Washington Street near the railroad tracks, Liberty Ciderworks co-founders Rick Hastings and Austin Dickey — wearing matching brown T-shirts bearing Liberty’s logo — are spending a warm Sunday evening checking on batches of cider in big stainless steel fermentation tanks and crossing off items on a seemingly unending to-do list before the public debut of Liberty’s artisan hard cider late this fall. There are labels to design, a tasting room to finish, local distribution to arrange, and of course bottles to fill, which currently sit in towering, plastic-wrapped stacks off in the corner of the modestly-sized production room. Similar in process to winemaking but with an end result that features an alcohol-by-volume percentage generally higher than most beers and lower than most wines, hard cider is quickly gaining attention across the Northwest and the country. Cider may make up just a fraction of the alcoholic beverage market, but industry watchers say it’s lately become the fastest growing market segment. It’s taken years of planning and countless experimental batches for Liberty Ciderworks to get to this point (both owners also have full-time careers) and the excitement between Hastings and Dickey over introducing their traditional, English-inspired apple cider to the Inland Northwest is as apparent as the aromatic mix of apples, yeast and tannins in the air. The timing for Liberty’s debut couldn’t be better. Hard apple cider is exploding across Washington, Oregon and the rest of the Northwest, evident in the number of new cidermaking operations that have started up in the region just this year. Spokane is now home to two cideries; in addition to Liberty Ciderworks, there’s Twilight Cider Works, which opened in May up in Green Bluff. West of the Cascades, the Seattle Cider Co. launched late last month, touting itself as the city’s first cidery since Prohibition. Cider is quickly gaining ground in Oregon, too, which is home to at least 15 cideries, according to the Northwest Cider Association. Portland and Seattle are also home to cider-centric bars: Bushwhacker Cider and Capitol Cider, respectively. The Northwest Cider Association, headquartered in Seattle, offers membership to cidermakers across Washington, Oregon, Idaho, Montana and western Canada, and estimates the number of cideries in the region is now double what it was at this time last year. Its member count currently sits at 32, with the bulk of those in Washington and Oregon. Some are brand-new, while others have been in operation for some time but only recently joined the young trade group. The association promotes its members and the industry through events like the currently ongoing third annual Washington Cider Week, a 10-day (Sept. 5-15) celebration of craft cider across the state. Those flavors include the bitter tartness of malic acid, found in higher quantities in the varieties of apples grown specifically to make cider. They aren’t as sweet or juicy as culinary apples, with their dry tannic acids, or tannins, that create a trait of dryness in hard ciders as well as wine. Cider apples tend to have less sugar, thus ciders aren’t as sweet because the sugar is largely consumed during fermentation. The semi-dry and dry traditional-style ciders gaining popularity now aren’t comparable to mass-produced ciders like Woodchuck and Hornsby’s, Hastings says. Some regional cidermakers are even leaning toward the creativity of craft beer brewing by adding infusions of hops, other fruit juices or herbs to their ciders. With Washington holding strong to its place as the No. 1 apple-producing state in the U.S. and Oregon hanging on at the No. 8 spot, it makes sense that cider should be big here, so why is it just now taking off? Hard cider was the beverage of choice for Colonial Americans, who brought traditional cider apples and the know-how of cidermaking over from England, where the beverage is still prevalent. Cider was often safer to drink than water, and also was the easiest way to preserve the orchard harvest. Though cider’s popularity was already in steady decline at the turn of the 20th century, most modern cidermakers credit Prohibition for largely wiping cider from America’s collective memory. There’s no one reason for cider’s sudden resurgence, but rather a number of factors. The craft beer movement may be reaching a market-saturation peak, and that gives cidermakers an opportunity to offer a new, related product to both beer and wine lovers looking to try something new. 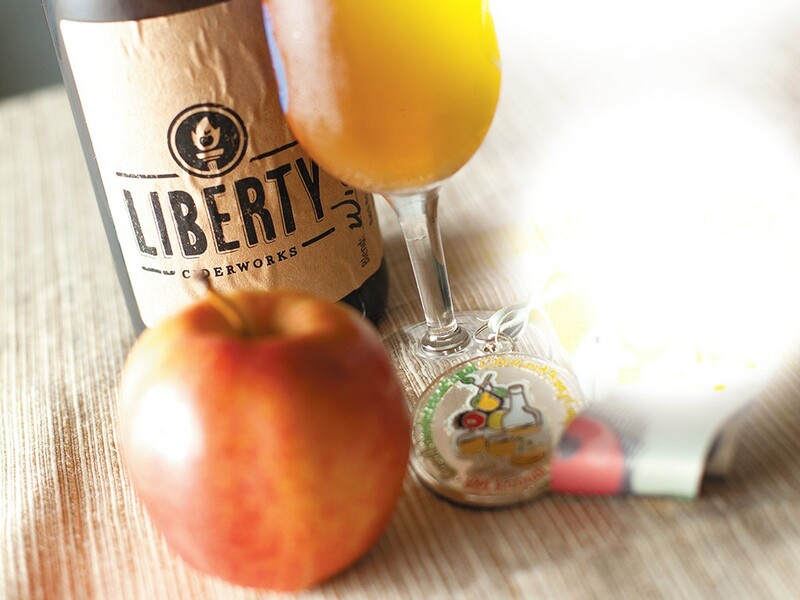 Liberty’s cidermakers, along with Twilight’s Jordan, agree that cider is the next logical step for beer enthusiasts, because of its local ties to the region and the artisanal process to make it. The current medical buzz around Celiac disease that’s created a demand for gluten-free foods has also influenced cider’s upsurge, since it’s a grain-free beverage. The local food movement is also partly credited with bringing cider back into the market across the Pacific Northwest because the apples are readily available from our orchards. Cidermaking is also well-supported in other states with notable apple production, including New York, Pennsylvania, Michigan and Virginia.